Lakewood, Ohio, population 51,000, doesn’t have any school buses. It never has. Because of the way its schools were designed and sited, this inner-ring Cleveland suburb doesn’t need buses — every child in the district lives less than two miles from their classroom, and most are within one mile. The school system runs a small transportation program for students with special needs — about 100 students use it, out of 5,800. The rest of the students are on their own, whether they walk, bike, or get a ride (Lakewood doesn’t track how students travel). To transport students to sporting events, the district contracts with another school system. Gordilla estimates the policy saves the district about $1 million a year, and that allows it to devote more resources to the classroom. “Parents are really appreciative that we do not constantly have to worry about big budgets for school buses,” says Kristine Pagsuyoin, mother of a sixth and eighth grader in the district. The city’s history has set the stage for the walkability of its schools. An old streetcar suburb, Lakewood was incorporated in 1911, before cars were in wide use. So the city has always been walkable and compact, and schools were no exception. All of the district’s school buildings are multi-story — which makes them more compact and walkable — and they’re all sited on smaller lots, in the middle of residential neighborhoods. 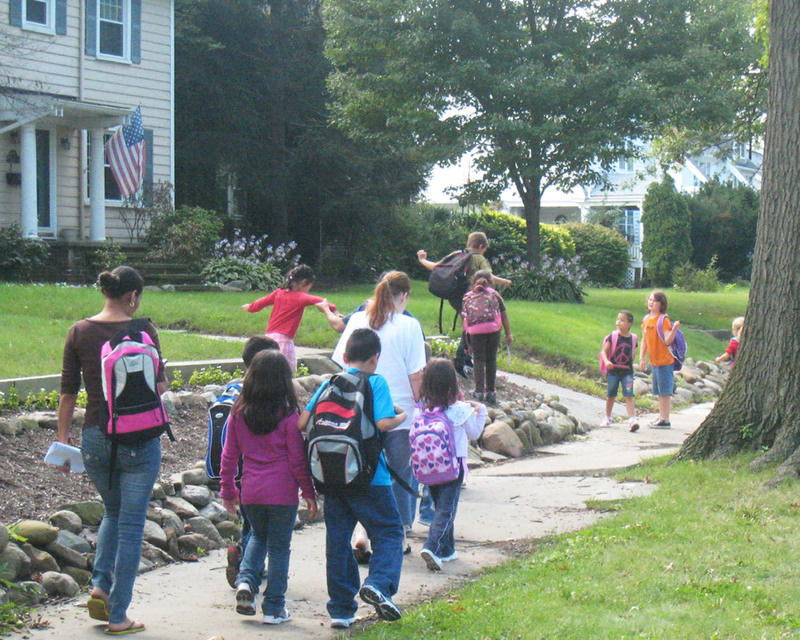 Over the years, as the school district has modernized and reduced the number of schools, Lakewood has consciously continued to make walking to school a high priority. 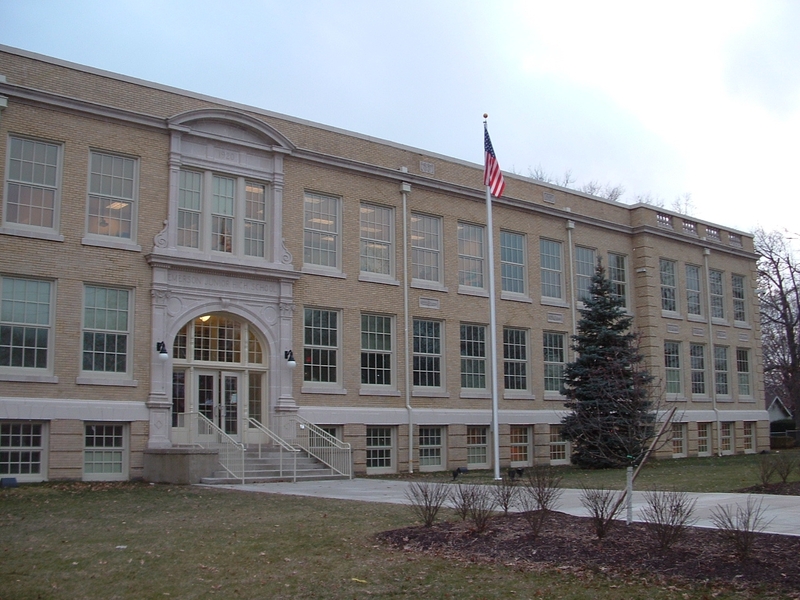 In the early 2000s, the city underwent a facilities masterplanning process as it began updating and consolidating many of its school buildings. Gordillo said parents made it clear during that process that they value the walkability of the school district and wanted things to remain as they were. So the district made its school-bus free transportation policy a continuing priority. When Lakewood reduced the number of schools, it made sure they — especially the elementary schools — were spaced out to be close to as many students as possible. Rather than trading the older, walkable buildings for a more sprawling style, many of the historic school buildings underwent historic preservation treatments. That means no giant parking lots either. Some parents or visitors might have to park on a nearby street. Part of the walkable design was by necessity. Lakewood is a “built-out” community, meaning all of its developable land is already occupied. Building a sprawling car-centric campus far away from where families live wasn’t an option, the way it is for a lot of suburban districts. Pagsuyoin says both of her children walk on their own about a mile, except when it’s very cold or her daughter needs to transport her cello. The exercise makes her feel more confident her children are getting enough physical activity, especially her son, who loves computer games. Both she and Gordillo says there’s something intangible gained as well. “It does create community that is hard to accomplish in districts where people are more spread out,” said Pagsuyoin. Children who walk or bike to school are better able to concentrate at school than those who don’t. Children who are more physically fit tend to have higher grades and test scores. Children who walk or bike to school are overall more physically active and physically fit. Walking to school can prevent or reduce ADHD symptoms. i know of one ADHD kid and from what i can tell his parents and babysitter never take him outside to run around and play. Interesting, but I’d love to know whether children in Lakewood actually do walk to school in large numbers, or whether those who would ride buses in other cities are driven to school in Lakewood. I live in Lakewood, and I can tell you the large majority of kids walk. I live in Lakewood. Most students do walk to and from school each day. I nanny for children in Lakewood and a four year and myself walk to pick up the 8 year old from school everyday. I grew up in Lakewood. I actually get to tell my kids that I walked a mile through the snow to get to MY (middle) school. 🙂 There is some public transportation, and some parents will drive their kids to school, but the majority of us grew up walking to school. too bad they all get pushed around and bullied not only by the students but the teachers too. More and more kids (including myself) have switched from the horrible Lakewood school district to online schooling. The staff are just plain rude and not helpful. I myself was bullied by multiple teachers and students, after five years of reports and no progress in the matter my family switched me to home schooling. I have been happy ever since. I live in Lakewood and my daughter (age 11) walks to and from school with friends nearly every day. My husband walks our 6 year old to and from school daily with a few other parents in the neighborhood. There are some that drive but there are definitely a LOT of walkers. Sorry you have had bad experiences. I love Lakewood schools. The teachers of all of my children have been top notch and caring. Emerson Elementary, Garfield Middle and the High School have been great. The best thing I love about our schools is the diversity! Many ethnicities and languages. Also the diversity in socio-economic statuses. It’s just wonderful. The only issue we have had walking is not with the local kids, but some inappropriate comments from the guys at St. Ed’s. I’m sorry you had a bad experience, but my kids have had a very positive experience in Lakewood schools. I was going to ask this same question. The school two blocks away from my house in Los Angeles is the most dangerous thing in the area, because at 3 pm every day, it attracts hordes of cars whose drivers are looking for one thing only (their own child) and will trample anything else that gets in the way. Given that there are also always several school buses and several Metro buses lined up outside the school at closing time, and that the majority of the students probably live in walking distance, I have yet to figure out why cars are allowed at all. California had the best school system in the nation under Republicans. California’s school system became worse once the Democrats took over this once great state. Remember that in the next election. I grew up in Lakewood and definately walked to both elementary and middle school. The single high school was about 2 miles away and we car pooled for that. There is no significant violent crime in Lakewood (at least no higher than other inner-ring suburbs). One kid got hit by a train while walking along the RR tracks coming home back in 70s. Other than that, I’ve never heard of a problem. I walked to school in Lakewood EVERY DAY … rain, sleet or snow! So glad I had the opportunity to do that! Yep. I went to one of Lakewood’s private schools and we walked too. But I went to LHS for high school and walked most days. We walked to the park or the pool or the library or the Detroit theater as kids and we walked to our summer jobs as teens, it was a great place to grow up. As a mom I would walk with my son to Dairy Queen or somewhere and I’d run into old friends or he’d run into friends – on warm summer nights it seems like every family in Lakewood is walking or biking down Detroit! Nowadays there is a great nightlife and restaurant scene too – foodie heaven. Lakewood has a great theater community, music scene, and we never miss the Lakewood Arts Fest or fourth of July at Lakewood Park – watching fireworks over Lake Erie and listening to the Lakewood Project. When I got married we moved further west, but I’m glad we still live close enough to come back and enjoy the things we love about the city. Sometimes I really miss living there. I always walked to school in Lakewood, with my sister and friends. Never a problem and always fun! In fact, Lakewood is very compact, so we walked EVERYWHERE. It was a great way to feel independent and be responsible as kids while having fun. We could walk to the store, school, the pool (everyday in the summer 1-4! ), church, library, and as we got older, family owned restaurants. My mom still lives in Lakewood and walks everyday just for exercise and she loves being close to the lake! It really is a great community. It was walking to school everyday in Lakewood that really let me know the ins and outs of the city. You can’t see the little nooks and crannies from a car, and some of the shortcuts too! I hated walking from Warren Road to Harding in the winter, but in the spring and summer, it was really nice! California’s educational system was decimated by the passage of Proposition 13, a citizen’s initiative passed in 1978 with a majority of support by both Democrats *and* Republicans. Not only did this ballot initiative reduce education funding in California, it also made future spending increases near impossible. The voters caused this problem, not the Democrats. Do your homework. And to return to the original topic, yes, walking to school is the best way to help children get exercise, develop independence and have fun with their friends. Though I didn’t grow up in Lakewood, Ohio, I grew up in walkable railroad suburb in California and I wouldn’t change my experience for nought. California school spending per pupil has been increasing for many decades; the prop 13 explanation doesn’t explain things. Lakewood kids are just life long walkers. We walked to school and friends’ houses as kids. We walked to after school jobs. Shoot… Sometimes I walked or rode my bike to the mall/movie theatre when it was one town over. If we wanted to go somewhere our first thought was walking or biking. Only in cold or bad weather did we even think about asking for a ride. And many of us delayed getting our drivers licenses because we were secure in our ability to get around without a car. I was 21 before I got my license and only got one because I wasn’t living in Lakewood at the time and was pregnant. Some of my about-30-years-old friends still don’t drive. I usually drive my daughter to school simply because it is on my way to work and she isn’t old enough to walk alone. But in decent weather we walk home from school. Once she is old enough she will walk to and from school all year unless the weather is bad. Her school even takes it a step further and started a Walking Club that meets before school in the winter so kids can get in extra exercise during a time of year many of them get rides to school and can’t play outside regularly. Lakewood is a total walking community and that is one of the many things I love about living there. Thanks for sharing your perspective! Really cool to hear. This is probably the reason I love to walk. I now live in a town with sidewalks on a few of the main streets and nothing in the neighborhoods, totally different than Lakewood. Sometimes I just feel the urge to walk. Uh, that graph shows that California’s per pupil spending has gone from 13% over average in the first column, to 12% under average in the last one. Yes, the dollar amount has gone up, but many other things have changed– special ed, women have other job opportunities now, various legal requirements, etc., and it’s happened on a national level. Montclair might be close to that. Or Morristown. How are there so many Lakewood residents on this blog? I remember walking to and from Harding from Elbur near Chris’ Warped Records! I miss Lakewood. The smells are something I always took advantage of. Living in Las Vegas, and working in Afghanistan, I wish I could bottle the smell of trees, burning leaves in October, the snow even when it was grey from the RTA buses. The distance never bothered me because there was always a few other kids to walk with until we reached their street. Hell, I even remember walking down to the little ceaser’s pizza place down on Detroit for lunch from Lakewood High. Omg. Memories..@Rik. When I lived there there was no such thing as “little Caesars” lol. It was ROMA pizza parlorl across from the movie theatre those were the greatest days of my life..If you didn’t grow up in lakewood. You certainly missed out..I lived on Lauderdale ave and loved every day of my childhood..
Great article! I grew up in Berea, which was immensely walkable – did it every day from kindergarten through 6th grade. And bicycled everywhere through the Metroparks. UPDATE: Lakewood, Ohio has announced that it will start citing people, including children, who decide to walk in the street instead of trudging through unshoveled or unplowed sidewalks – often made worse by plow services that deposit mounds of snow on the sidewalks. There is no mention of whether Lakewood will start citing lazy homeowners and businesses that leave their sidewalks unplowed and unshoveled contrary to their legal obligation to clear their sidewalks. Angie, can you please follow-up on this development? Yeah, Lakewood also bans skateboarding and rollerskating in the street. I think that is extremely backward. They “all” get pushed around? I grew up in Lakewood and we definitely walked to school. In middle school my mom wanted us to go to the one that was 1.5 miles from our house so we rode our bikes and if it was really cold took the RTA bus down Detroit road (only because I had asthma) heck even when I moved back for a while after college I would walk to and from the bars to avoid DUIs! 🙂 I live on the east side now and am pregnant with my first child. I am trying to convince my husband that we should buy a house in Lakewood because I want my kids to have the same experience I did. Creative blog post . I Appreciate the points ! Does anyone know if my assistant might grab a fillable OH ODT SD 101 Long document to work with ? Hi Kirstie, my assistant found a sample OH ODT SD 101 Long version at this place https://goo.gl/U4cSyr.